About - His Hands On Africa Inc. In the aftermath of the 1994 Rwandan genocide against the Tutsi, life expectancy from birth was just 28 years, according to data by The World Bank. Today, that figure has more than doubled. However, despite this increase, 18% of morbidity cases are directly linked to treatable oral diseases that are easily preventable and curable, with access to basic dental care and education, according to the 2016 reports by the Rwandan District Hospital. *Rwanda currently has 48 dentists in a country with a population of almost 12 million people, which translates to about one dentist for every 250,000 potential patients. By comparison, the United States has approximately 1 dentist per every 1,600 patients. Despite major efforts to rebuild the nation, the statistics remain in despair and the need for more dental care professionals is greater than ever. We simply cannot overlook this dire and overwhelming need. His Hands On Africa was created to improve the oral-health care need in Rwanda but a few questions remain: how does a developing country scale affordable and quality healthcare when the majority of its population live on a few dollars a day? How do you maximize foreign aid while also empowering the nation to partner in a sustainable solution for the long term? How do you reach people who do not have the means or ability to access locally based facilities? His Hands On Africa believes in equipping communities to achieve sustainability with dignity. 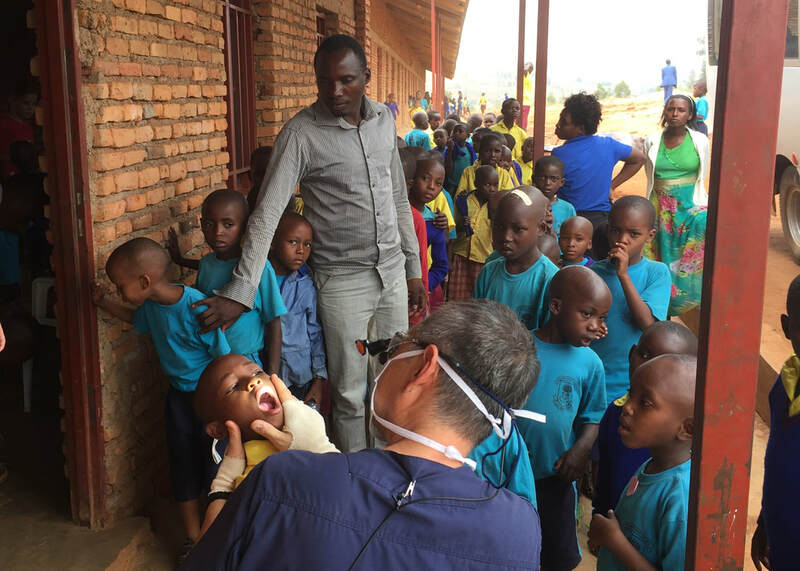 To address the lack of dental services, HHOA has identified a three-fold approach in multi-year stages that is based on fostering relationships with local communities and empowering Rwandan citizens to invest in their future. ​2013 was a special year for Thomas and Lita. They were celebrating their 25th wedding anniversary and Thomas’ 50th birthday. As they explored various options in which to celebrate these milestones, they ultimately decided on a safari trip to Africa. However, God had very different plans in mind. In January of that year, Jean Claude Rwagasore, one of the founders of Best Family Rwanda, spoke at their church and shared his testimony about the unimaginable pain and suffering he experienced during the 1994 genocide against the Tutsi. An estimated one million Rwandans were killed while an estimated two million were displaced and became refugees. Amidst this pain and tragedy, Best Family Rwanda became a haven for orphans and vulnerable children through Christ- centered ministry. Only through God’s healing and restoration could this be achieved by a young man who himself had lost his family during the genocide. ​From Jean Claude’s testimony came the calling to both Thomas and Lita individually: God asked them to go and serve Him in Africa in place of the safari. In united obedience, the Lees went on a short-term medical and dental mission trip to Rwanda with their church. It was during this trip, as they treated and prayed for those in need, they received their long-term call to commit their remaining years to healing and serving the people of Rwanda. Through Thomas and Lita’s new found desire to transform lives and bring the hope and healing of Jesus Christ to the people of Rwanda, His Hands On Africa was born. His Hands On Africa is a non-profit organization that aims to raise up Christian dentists who will serve their communities through Gospel-centered health care. Join us and become an extension of His Hands to heal and bless others. Partner with us to help raise Christ-centered dentists through education. Do you want to remain updated on all the ministry developments? We would love for you to. Just put in your basic information to be subscribed to our newsletter. ​Copyright © 2018 His Hands On Africa Inc. All rights reserved.